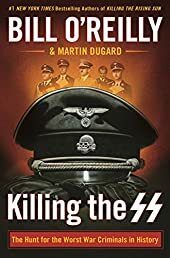 Killing the SS: The Hunt for the Worst War Criminals in History (Bill O'Reilly's Killing Series) | Your #1 Source for Kindle eBooks from the Amazon Kindle Store! As the true horrors of the Third Reich began to be exposed immediately after World War II, the Nazi war criminals who committed genocide went on the run. A few were swiftly caught, including the notorious SS leader, Heinrich Himmler. Others, however, evaded capture through a sophisticated Nazi organization designed to hide them. Among those war criminals were Josef Mengele, the “Angel of Death” who performed hideous medical experiments at Auschwitz; Martin Bormann, Hitler’s brutal personal secretary; Klaus Barbie, the cruel “Butcher of Lyon”; and perhaps the most awful Nazi of all: Adolf Eichmann. Killing the SS is the epic saga of the espionage and daring waged by self-styled “Nazi hunters.” This determined and disparate group included a French husband and wife team, an American lawyer who served in the army on D-Day, a German prosecutor who had signed an oath to the Nazi Party, Israeli Mossad agents, and a death camp survivor. Over decades, these men and women scoured the world, tracking down the SS fugitives and bringing them to justice, which often meant death.